This is the start of something great. 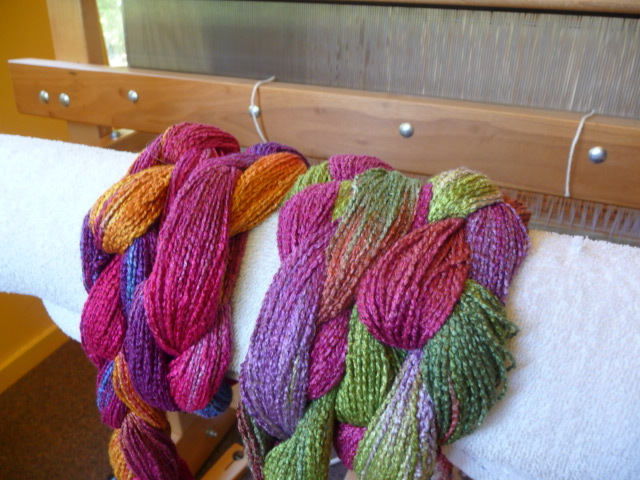 Two textured rayon warps, dyed by Kathrin Weber of North Carolina (aka Blazing Shuttles), ready to go onto my loom. 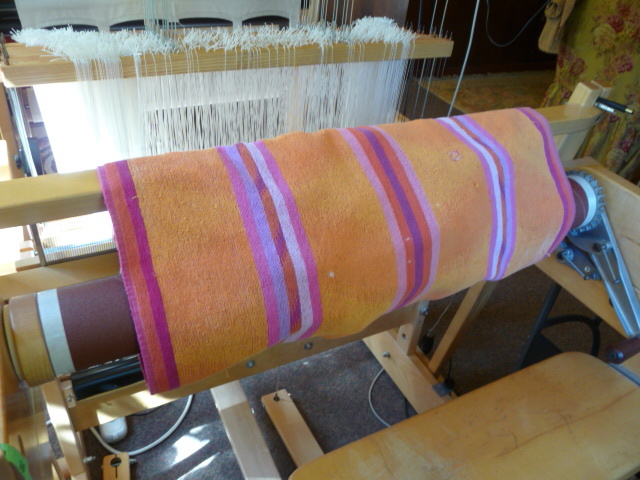 Wound around the towel-protected sandpaper beam at the front of the loom, ready to be cut open and distributed across 13.2 inches at the center of the reed. First the one on the right, spaced as I’ve planned; then the other will fill in the blanks. All done with that part. Looks a bit messy, I know, but fear not — all will be well. At the back of the reed. 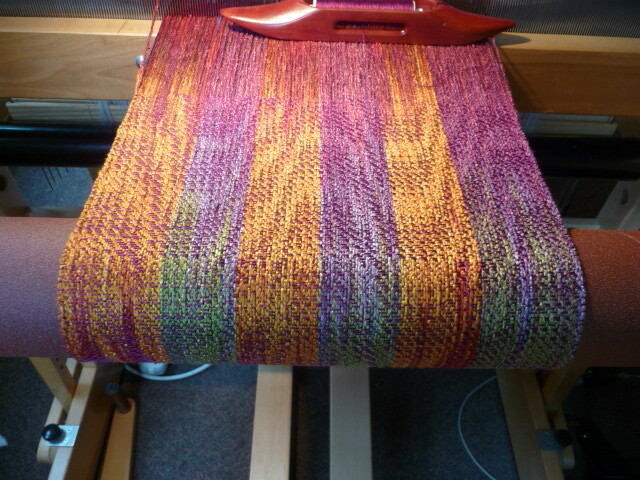 You can see the “striping” I’ve set up with the two colorways, and things don’t really look so messy after all. 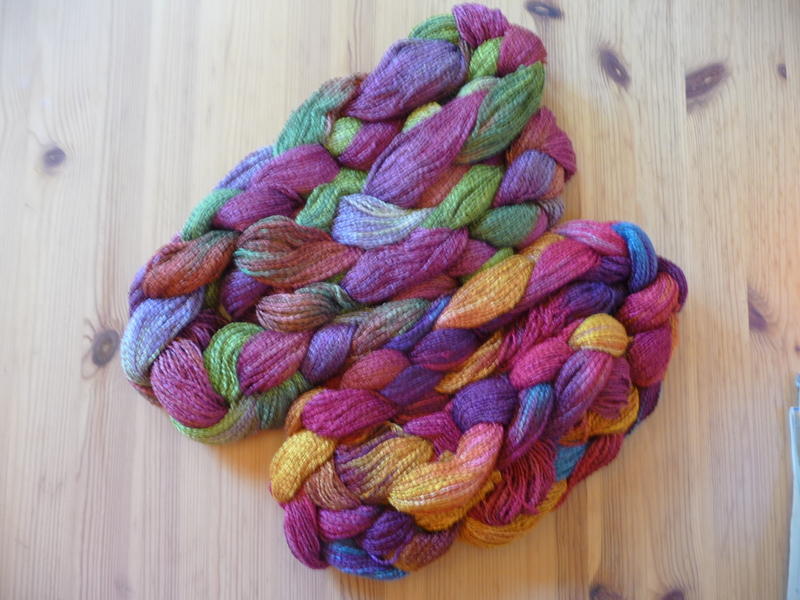 All those pretty tantalizing threads!! 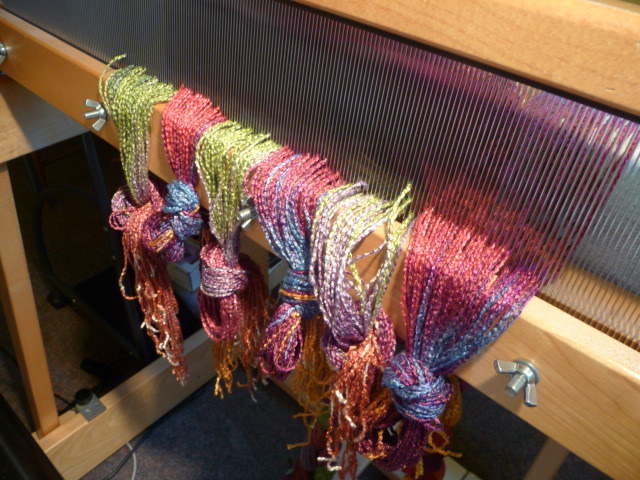 With two young cats in the studio/home, I’m careful to protect the work on the loom overnight and between work sessions. An old beach towel makes an effective barrier to curious felines. 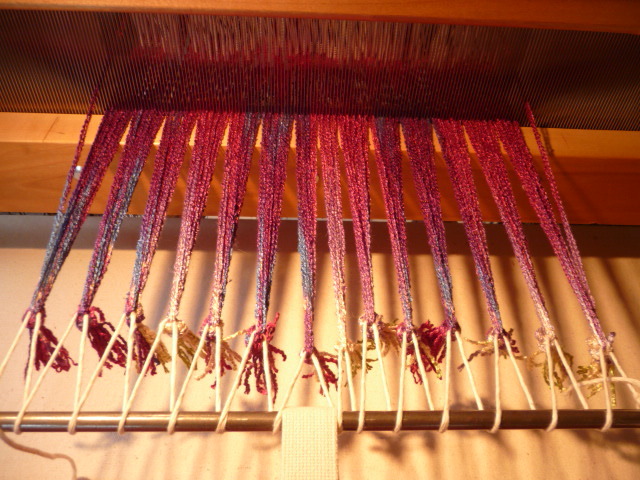 Another good day’s work — all 200 threads in the proper order to produce the patterns I’ve designed on the computer, wound onto the warp beam at the back of the loom, and seen here at the front, lashed to the stainless steel rod with heavy cord, under tension. 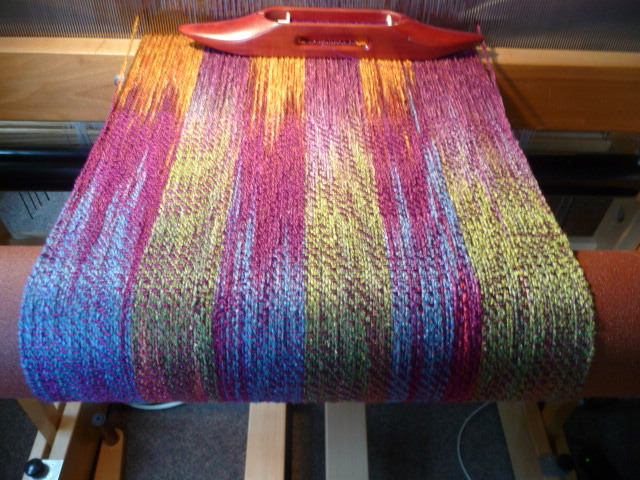 The lashing enables me to easily make minute adjustments to the tensioning of the threads across the width of the warp, aiming for it to be even everywhere before I begin weaving. 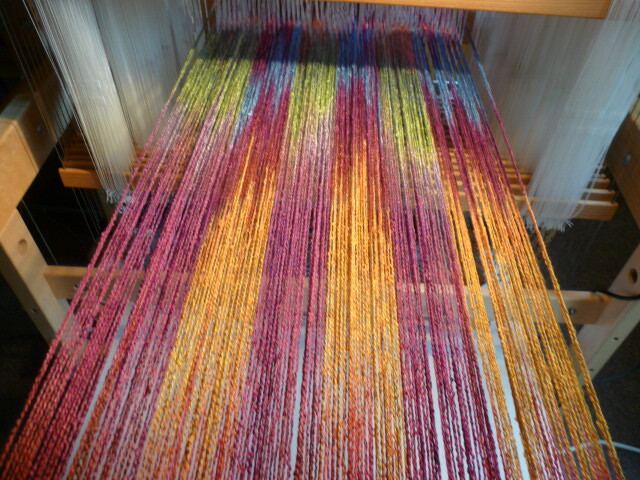 A look at a portion of the warp before weaving begins. Gorgeous! 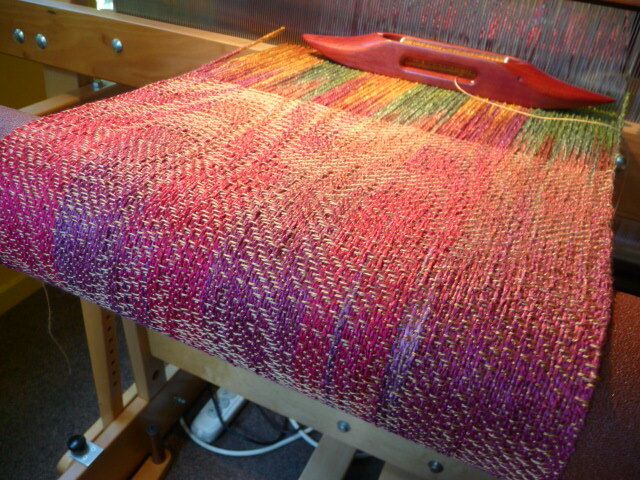 A good beginning on the first scarf, woven with a fine red-purple tencel. I’ve named this the Fireworks Series, both because of the timing and the colors. 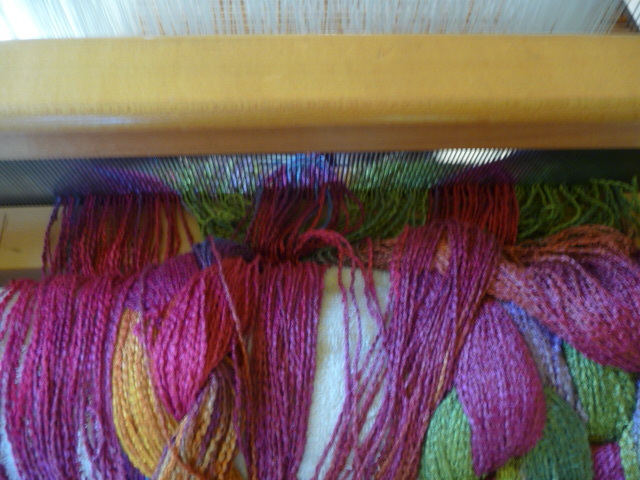 A different section of the same scarf. The colors keep shifting, and the juxtapositions continue to be exciting. 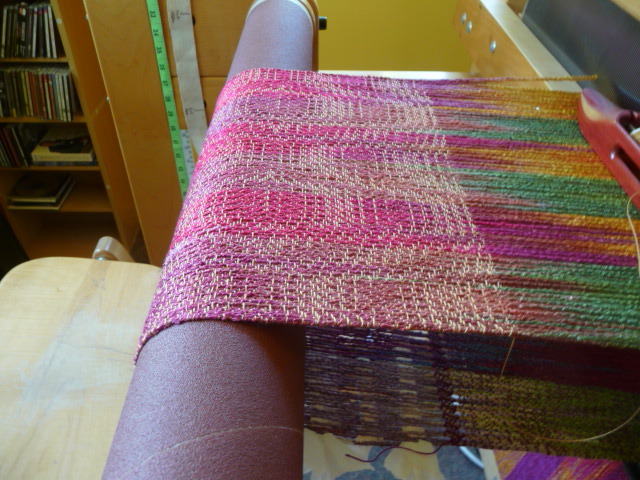 Here’s an early section of the second scarf, woven with an antique gold tencel in an even more elaborate pattern than the first one. Same section, seen from the side, showing the pattern more clearly. 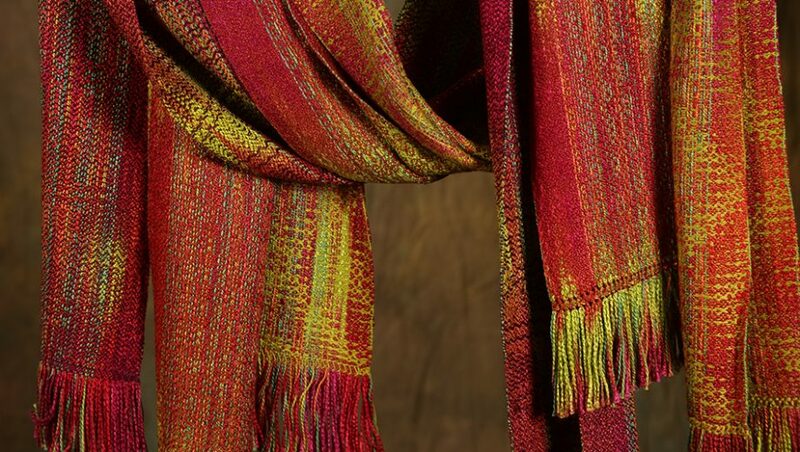 The angle of the light makes a big difference in what you see in these pieces, and when they’re off the loom and being worn, the colors and patterns will shift and change in intriguing ways. Just stumbled across this. How wonderful in every way! So glad to have been a cog in this creative endeavor. Fascinating and such a thorough display of the entire process. Talk to you tonight with pleasure! As I’ve been working on this series, I’m aware that it’s probably the most lively riveting work I’ve ever done. And that’s saying something — after 30-odd years at this. Can’t wait! I love hearing how exciting this is to you, and seeing the work in progress with all your reassurances that yes, it is all making sense even when it looks messy. Oh, yes, these are very exciting. And glorious. Can’t wait to see them!